An operatic satire about former prime minister Brian Mulroney hits the big screen next month. 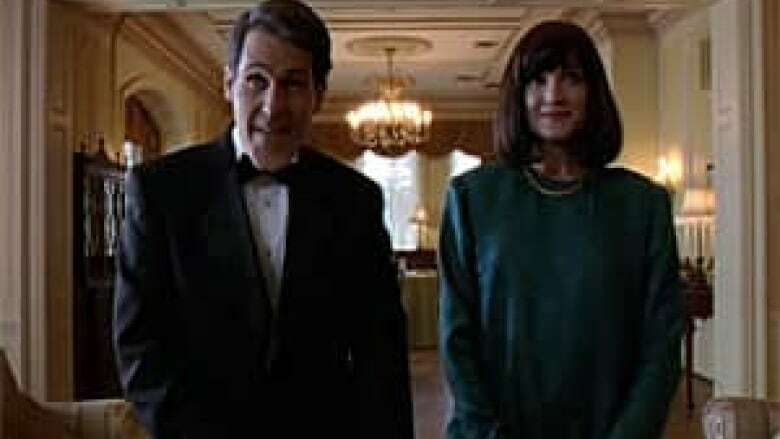 A scene from the trailer of 'Mulroney: The Opera,' starring Rick Miller, left, and Stephanie Anne Mills as Brian and Mila Mulroney. The Canadian film opens in April. Mulroney: The Opera is billed as "a unique viewing experience for film, opera and political satire lovers." The over-the-top comedy stars Dora and Gemini award-winner Rick Miller and Stephanie Anne Mills as Brian and Mila Mulroney. Comedian Dan Redican wrote the script. A slew of Canadian veterans tackle other political personalities: Colin Mochrie is Jean Chrétien, Wayne Best plays Pierre Trudeau, Ted Dykstra portrays Ed Broadbent, Joe Matheson is Ronald Reagan, and Sean Cullen is Mulroney cabinet minister Robert Coates. Director Larry Weinstein says Canada's 18th prime minister is "the perfect subject for an opera, for epic film, for comedy, for tragedy." Mulroney: The Opera will be shown across Canada in movie theatres on April 16 and April 27.